For four solid decades, Calgary Stampede cutting events have proudly sported the Bill Collins brand. And this year, the iconic Canadian horseman has provided the 31st annual Calgary Stampede Cutting Horse Futurity with a special touch that few will ever forget. Collins, whose name is synonymous with the sport of cutting in Canada, established in 1973 the Stampede’s very first Cutting Horse Competition, which by his own declaration has since been held “come hell or high water” in conjunction with the Greatest Outdoor Show on Earth. 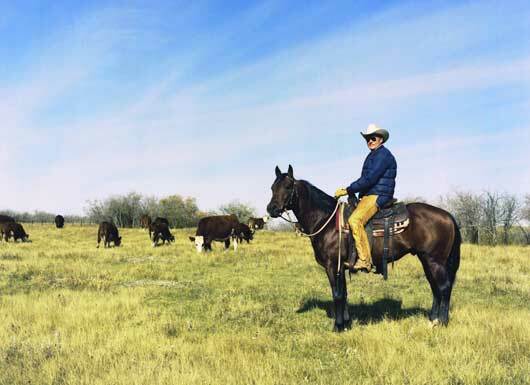 Collins’ love of horses, and his considerable training and riding talent, have carried him to Hall of Fame appointments with the National Cutting Horse Association (NCHA), American Quarter Horse Association (AQHA), and Canadian Cutting Horse Association (CCHA). He’s a member of the Order of Canada . And he’s taken tea with Prince Philip — by invitation, of course — in London . This week, more than 100 riders and 200 horses from as far away as Texas and Ontario will rendezvous at the Corral on Stampede Park for the Stampede’s annual Cutting Horse Futurity, presented by Wrangler, which started Wednesday, Oct. 12 and runs through Sunday, Oct. 16. And on Saturday, Oct. 15, the Futurity’s live and silent auction at the Corral will feature a special Collins contribution. The native of Big Valley , Alta., who now lives in Sherwood Park , is donating one of his championship saddles to the auction. As per usual, all proceeds go to the scholarship fund fittingly known as the Bill Collins Youth Excellence Award. “If you can be bigger than an icon, he is. It’s that simple. History books don’t talk about cutting in Canada at all, without a parallel mention of Bill,” notes Pete Fraser, vice-chair of the Stampede’s Western Performance Horse committee. The Stampede’s Cutting Horse Futurity is the premier cutting event in Canada , and will once again offer a prize purse of more than $300,000. The event features Open and Non-Pro rider categories — Open for horse trainers and professional riders, and Non-Pro for those who make no part of their income by training horses. Non-Pro entries can only ride horses owned by themselves or immediate family members. Equine age classes are headlined by the Futurity category for three-year-olds, and also include Derby (four-year-olds) and Classic Challenge (five- and six-year-olds). On the Non-Pro side, there’s also the 7 Up class for horses aged seven years or older. A $50,000 Limit Amateur Class, for those with NCHA earnings of less than $50,000 as of Jan. 1, 2011, is also offered within Non-Pro’s Derby and Classic Challenge classes. Collins, 87, is a revered figure, and not just for his cutting prowess — although he trained and showed the legendary Peponita to the 1974 Canadian Novice Horse and Open championships, a duplicate feat that’s never been matched, and acted as one of the sport’s elite judges for nearly a quarter-century. Collins was also a chuckwagon outrider, working for the Ron Glass and Orville Strandquist outfits. He was an accomplished show jumper. And he claimed Canadian calf-roping championships in 1951, ’52, ’56, and ’57. The first and second go-rounds for most categories will be held through early Saturday in the Stampede Corral. Finals for the three Open classes will be staged on Saturday evening, while the four Non-Pro finals are slated for Sunday. The action starts at 8 a.m. daily from Thursday through Saturday, and 9 a.m. on Sunday.